Looking for more gluten-free snacks for your allergy~friendly home? These are so easy for lunches, play dates, sleepovers or to just throw in your purse to have for that 'just in case' moment. And my kids think they taste great! The packaging states this product is gluten-free as well as kosher, as the circle U indicates. According to this ingredient list, these fruit snacks may also be an option for those of you looking to avoid milk, eggs and nuts. 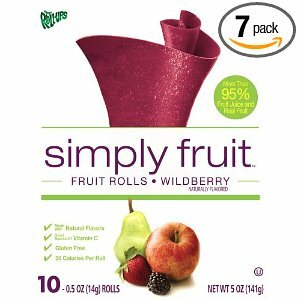 Wildberry Simply fruit FRUIT ROLLS, distributed by General Mills Sales, Inc., Minneapolis, MN. Ingredients include: APPLE JUICE CONCENTRATE, DRIED APPLES, BLACKBERRY PUREE, STRAWBERRY PUREE, CANOLA OIL. CONTAINS 2% OR LESS OF: FRUIT PECTIN, LEMON JUICE CONCENTRATE,VITAMIN C(ASCORBIC ACID), BLACK CARROT JUICE CONCENTRATE AND BLUEBERRY JUICE CONCENTRATE ADDED FOR COLOR, NATURAL FLAVOR, CITRIC ACID AND SODIUM SULFITE ADDED TO PROTECT COLOR. For more information, you can visit: General Mills Product List or 1-800-248-7310. When checking for this particular brand there appears to be some simply fruit FRUIT ROLLS which are 90% fruit and others 95%. With summer play dates and summer camps coming up for so many, it's wonderful having on hand snacks that our kids with food allergies AS WELL their friends without allergies can enjoy!